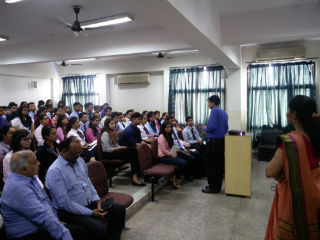 A session on entrepreneurship was organised for PGDM Year I students of section A and B on August 04, 2017. The guest speaker for the session was Dr. Satya R. Acharya, Senior Associate Professor at Entrepreneurship Development Institute of India, Ahmedabad, Gujarat. The session started with an interesting discussion on the meaning of an entrepreneur and entrepreneurship. 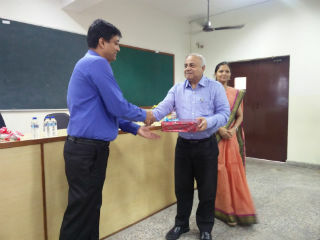 Thereafter, Dr. Acharya threw light on the need for entrepreneurship in today’s scenario, especially in India. He also shared many examples about various entrepreneurs such as the MBA Dosawala, Ritesh Agarwal, founder and CEO of OYO Rooms, etc. He emphasized about many sectors that are expected to grow in the next 5-10 years with a lot of opportunity for entrepreneurship to take a leap. The session was very interactive and the students showed a lot of enthusiasm by asking various questions during the session.